Pocketnow dropped some images of the HTC Flyer in T-Mobile regalia earlier today, apparently dismissing rumors that the unbranded version of the Flyer would not be headed to American shores. 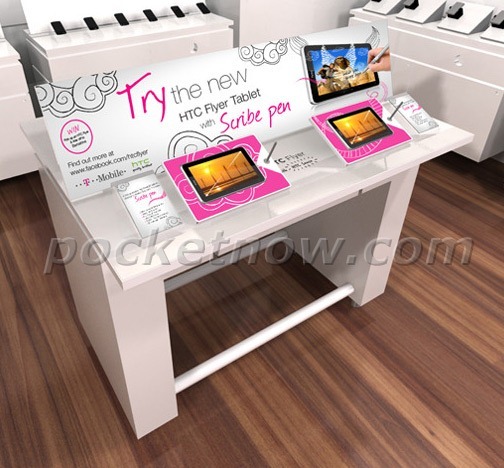 In particular, the image below of a rebranded T-Mobile USA YouTube page would seem to all but confirm that HTC's stylus-sporting tablet will be making a stateside-debut. 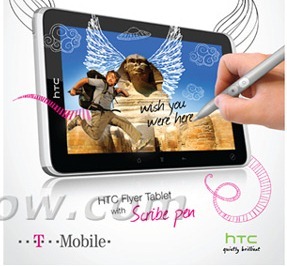 HTC's Flyer tablet runs Android 2.3 (with a planned upgrade to Honeycomb), and utilizes a single-core, 1.5GHz processor. The 7" tablet's pricing has to be confirmed, but speculation on a Wi-Fi only version (read: not this T-Mobile edition) hovered around $500-600. This device will then probably be getting contract pricing, but it's anyone's guess as to how much a subsidy T-Mobile is planning. Though it will likely have to be a pretty hefty one - considering the Flyer's larger-screened, dual core competition on T-Mobile, the Honeycomb-running LG G-Slate, is priced at $529 on a two-year agreement. Also absent is any mention of 4G in the Flyer promotional pictures, which, considering how much T-Mobile loves to brag about its HSPA+ network, probably should be taken to mean that the Flyer doesn't have it. Of course, that's just a guess.